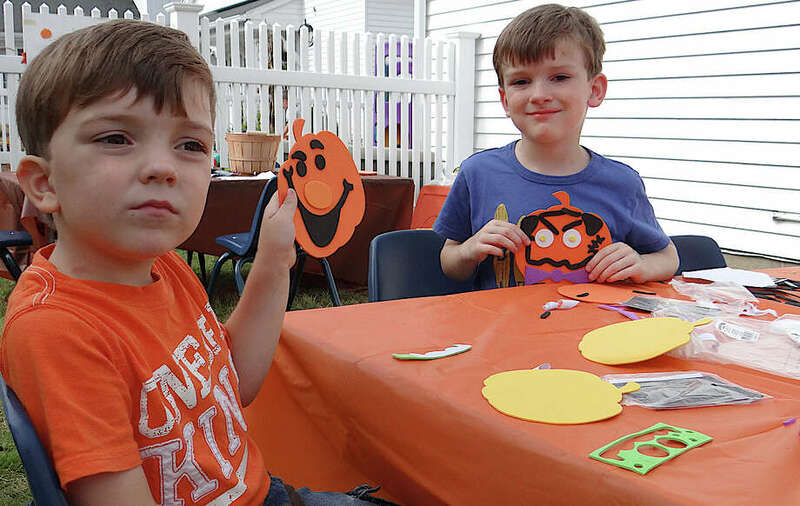 Zach Johnston, 3, of Easton, and his brother Nate, 5, making Halloween-themed crafts at Our Saviour's Hill Farm Fall Festival on Saturday. Great fall weather Saturday was an extra blessing for the all ingredients needed for seasonal fun at Our Saviour's Lutheran Church's 4th annual Hill Farm Fall Festival. "We're glad to have such nice weather," said Bob Roy, one of four coordinators of the Hill Farm Fall Festival. "This is a great family attraction with lots to do for all, and every year the number of vendors has grown." Every year also brings a new beneficiary of proceeds from the event. This year, the charity selected was Project from the Heart, a local group helping to send care packages to American military personnel overseas. "This effort is part of our ministry's missions," said Roy. Mary Lou Edwards, staffing a Project from the Heart booth with fellow volunteer Debra Mahoney, said it was a valuable boost to have support from the church, where the group also packs supplies for the troops. "Using volunteers, we put together 20 packages per week going to our servicemen and women in Afghanistan," Edwards said of the group's work. Edwards said the group was established in 2002, operating out of Fairfield resident Pat Vida's living room. Vida is a Fairfield retired police officer's wife, as are the other members of Project from the Heart. Edwards noted that Vida's inspiration for the project occurred when she saw her daughter sing at the town's first 9/11 memorial service. The group actually pre-dates 2002. "Pat originally began it during the Vietnam area," said Edwards. "She and other police wives sent shoeboxes full of goodies to our troops" serving in that Southeast Asian conflict. A typical package includes about 100 items, from personal hygiene products and beef jerky to reading material, socks and soap.